Katamari Forever is one of the most bizarrely addictive games that I have ever played. The premise of the game is that the King of the Cosmos has fallen asleep and you (the Prince) have to try to rouse him from his cosmic slumber, while performing tasks for the Robo-King who has taken his place, or at least I think that’s what happens. Realistically, the narrative, if you can call it that, is probably the least important part of Katamari Forever. Although, it does help add a certain eccentric charm to the game. Half of what makes Katamari Forever great is the act of rolling a katamari. At the beginning of each challenge you have a katamari of a specific size, and you are given a certain amount of time to reach a goal of a certain larger size. You accomplish this by rolling over things that are smaller than your katamari, which causes them to stick to the ball, and you slowly get bigger, allowing you to roll up larger things and get even bigger. It’s a mechanic that I find to be both unique and highly addictive. However, as much fun as it is to roll things up, half of what keeps me coming back to Katamari Forever is the aforementioned eccentric charm. Each of the stages are drawn out in a cartoony cell-shaded art style, which looks bright and beautiful in high-definition. The music in Katamari Forever is a collection of re-imagined songs from previous Katamari games. Imagine a remix of a big-band swing tune sung almost entirely in Japanese, under which you create a quiet cacophony of sounds as you roll up everything in your path. I’d probably describe the entire experience as a Saturday morning cartoon as seen through the eyes of a conservative Japanese man on ecstasy, but my self-imposed lack of experience with recreational drugs reduces such a statement to mere conjecture. 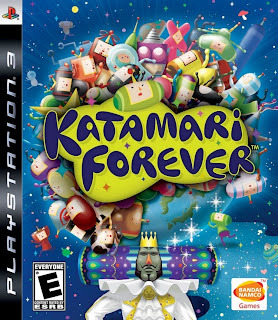 It’s worth mentioning that every facet of Katamari Forever is in some way a recycled or remixed version of some part of one of the previous Katamari games (which is why the game is titled Katamari Tribute in Japan). However, I found the whole game to be a fresh-enough take on a concept that I had never grown tired of in the first place. With this game being likely the last new game in the series (the creative mind behind the concept, Keita Takahashi, has since moved on from the video game industry to design playgrounds), Katamari Forever ends the series as the best (or at least the most beautiful) game in the history of Katamari.